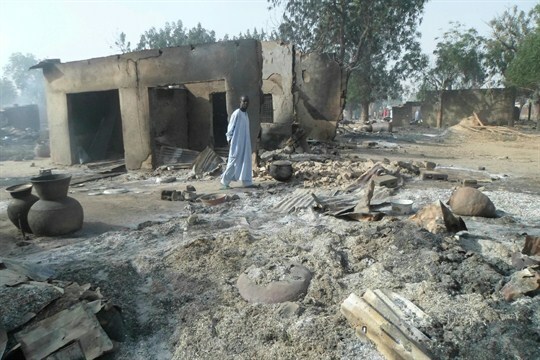 A man walks past burned-out houses following an attack by Boko Haram in Dalori village, near Maiduguri, Jan. 31, 2016 (AP photo Jossy Ola). In this week’s Trend Lines podcast, WPR’s editor-in-chief, Judah Grunstein, and senior editor, Frederick Deknatel, discuss what the consolidation of power by Chinese President Xi Jinping at the 19th Communist Party Congress means for China and the world. For the Report, Hilary Matfess talks with Peter Dörrie about why the U.S. should reconsider its growing security partnership with Nigeria’s military, which has been accused of human rights abuses and counterproductive tactics in its battle against Boko Haram. Can Xi Pivot From China’s Disrupter-in-Chief to Reformer-in-Chief?